On the cover of Martin Bodek’s new book about Passover, three small pictograms set against a stark white background catch the reader’s attention: a man speaking, a sea shell, and a ram. For the graphically challenged, here’s the translation: “Haggadah” literally means “the telling,” hence the speaking man. The shell stands for the shel in “Haggadah shel Pesach,” Haggadah of Pesach. And the ram, of course, represents the lamb that was sacrificed by the Israelite slaves in ancient Egypt on the eve of the first seder meal. Put it all together, in emojese, and you get a book that provides the blueprint for the Passover seder, but without a single word of text. A 43-year-old language aficionado and IT specialist who lives in Passaic, Bodek is the author of five previous books (which include a King James Bible-type of the George W. Bush presidency and a putative diary of the Bible’s Noah). He calls his Haggadah the first one completely in emoji. The symbols, designed in 1999 by Japanese programmer Shigetaka Kurita (emoji means “picture character”), are used to add emotional punch to text messages and e-mails and have become the language of choice for a generation reared on texting and smartphones. Bodek’s “1.0” self-published Haggadah is a 128-page, full-color nothing-but-emojis version; an expanded, 184-page “2.0” version published by Ktav comes complete with a “how-to” guide, glossary, and some other explanatory notes in standard English. It includes all of the traditional Haggadah text, said Bodek. 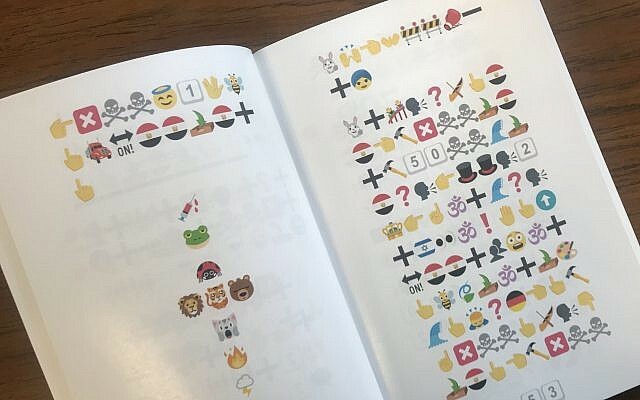 “The first thing that entered my mind was a full-length Haggadah,” Bodek said, calling emojis the modern form of hieroglyphics — pictograms that convey a message. “It’s a universal language,” if not one that is totally comprehensive — there are no specific emoji symbols for exodus, or Purim. Bodek said it was hard coming up with acceptable emoji symbols (he said there are about 3,000 of them) for some of the seder’s rabbinical names and Pesach concepts. Like charoset. Bodek put his imagination, sense of humor, and poetic license to work. The traditional seder food represents the brick and mortar used by the Israelite slaves, so he finally decided on the mortar board worn at graduation ceremonies. Other emoji translations include, for the Four Questions, four question marks; for rabbis, rabbits; for forever, the number 4 and an evergreen tree. As for God, the emoji symbol is the one for “the name,” the literal meaning of Hashem, traditional Jews’ name for God. So they’ll surely get the bright red circle and the crashing wave (Red Sea) and the person walking, the outbox arrow, and the flag of Egypt (the exodus from Egypt). But even they (and surely their elders) will likely have to work at the brain-teasing string of six emojis — inbox arrow, calendar page, smiley face, ram, inbox arrow, and flag of Israel — that marks the yearning of Jews around the world at the end of the seder: Next year in Jerusalem. Steve Lipman is a staff writer at The New York Jewish Week, NJJN’s sister publication. He can be reached at steve@jewishweek.org.